Finally got around to doing the cluster LED swap. Just finished this up tonight. Im not the best solderer so i enlisted the help of my cousin. payed him in beer and pizza. Took about 2 hours from taking the cluster off de-soldering, soldering and putting everything back together, I love how it turned out though. 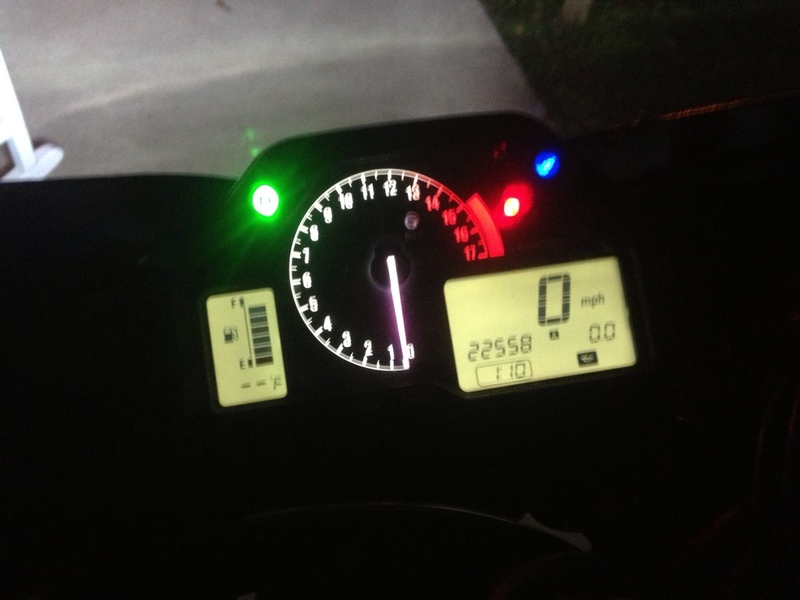 I did all white displays and the main part of the tach white and the last two on the tach were red. Total investment was around $13 + time, beer, and pizza. HUGE shout out to LEDs - flexible LED strips, LED modules, 12v LEDs, i placed my order on Thursday 1/3/13 around 4:00 p.m. and by 4:25 p.m. they were already shipped out and i had a tracking number. LEDs showed up at my door today (1/5/13) around 3:00 p.m. Here's a quick picture i got with my phone. Nice....you'll love how vibrant color is...I just did my blue...totally worth the time. Looks clean, for anyone wanting to try this on the F4i I did a How to awhile back. yea its a huge difference i love it. Quick Reply: Finally got around to doing the cluster LED swap.